Ugly shoes are all the rage. 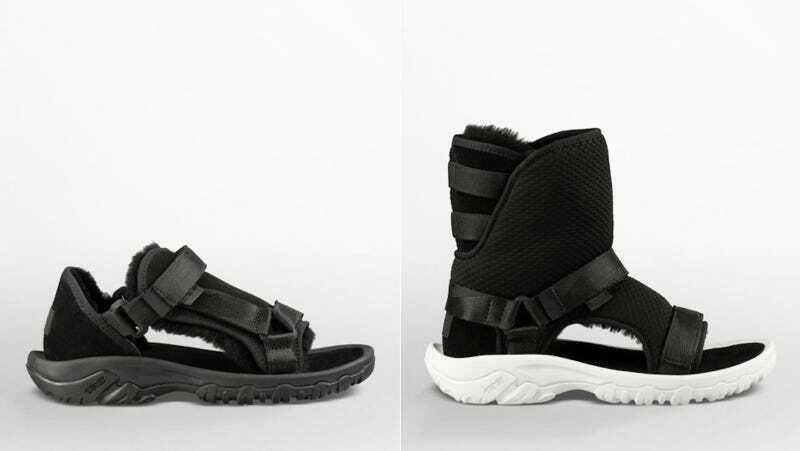 But does America’s fiery passion burn hot enough to make these Teva x Ugg mashup monstrosities successful. I don’t know—would you wear them? Oddly enough, there may be something to this phenomenon. U.S. consumers seem to have a fascination with hideous shoes. They’ve helped build two bastions of practical yet absurd footwear: Ugg boots and Crocs clogs. Ugg hauls in more than $1.5 billion in annual revenue, while Crocs makes $1.1 billion. Although both have expanded into lots of other kinds of shoes, from wedges to loafers, their ugly classics remain best-sellers. “For their part, executives at the parent of Ugg and Teva contend their latest offerings are ‘unique and fashion-forward’ and that they ‘celebrate the expression of freedom’ and the ‘art of footwear design,’” Bloomberg Businessweek notes. The “boots” are selling for $225, and the sandals for $175. New idea for funding paid family leave: Let’s institute a tax on bad taste, cleverly disguised as selling high-fashion footwear made out of literal rotten banana peels.